DSG International, the owner of Currys and PC World, is to reduce the number of its Currys.digital stores and cut its dividend as part of a revival plan. 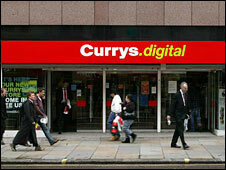 It said 77 Currys.digital shops out of the 177 outlets would shut as their leases expire over the next five years. The closures are part of a major shake-up of DSG, which it hopes will cut costs by £50m in 2008/09. The announcement came as DSG reported a 1% rise in like-for-like sales for the year to 3 May. DSG's shares tumbled almost 12% on the news, but later rebounded somewhat to close 7.5% lower at 65 pence. DSG has issued two profit warnings this year amid a challenging trading environment as cash-strapped consumers struggle with higher household bills and mortgage repayments. DSG's new chief executive John Browett warned that the deteriorating economic backdrop made it difficult to forecast business performance. "Customers have become increasingly promotion and deal driven, impacting gross margins," he said. Tony Shiret, an analyst at Credit Suisse, said that Mr Browett expected the internet to take 30% of the UK electricals market over the next three or four years, compared with the 10% it currently accounts for. "So the outlook for the company's shops obviously looks pretty grim," he added. The transformation of the DSG group will include store refits at Currys, PC World and Currys.digital, and cost savings at its head office.